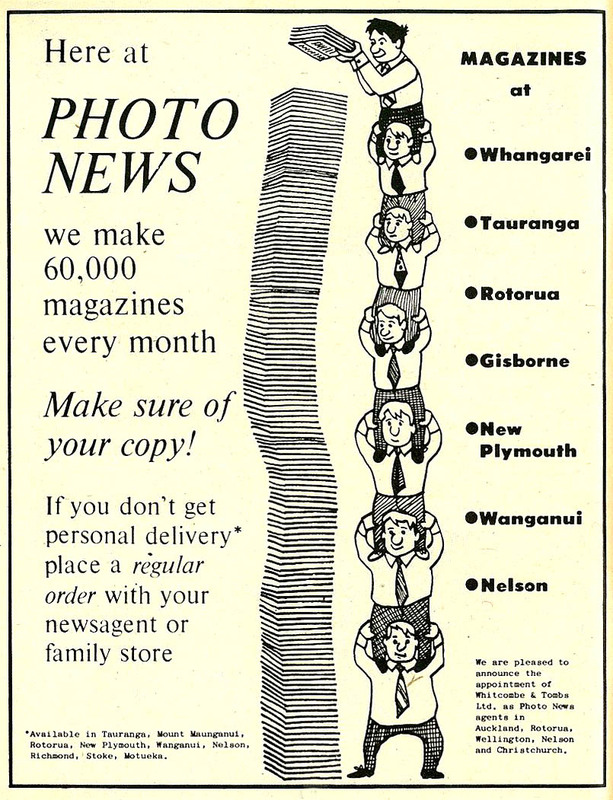 This website is a full-text archive of certain regional editions of The Photo News, a monthly magazine published by Logan Publishing of Gisborne between 1954 and 1975. Over time, with the assistance of the communities in the various regions served by the Photo News, we hope to make more editions available. The Logan Publishing Company began at Robert (Bob) Logan’s residence in Gisborne, New Zealand June 1954. Bob’s eldest son John remembers doing the monthly delivery of Gisborne Photo News to dairies and bookshops around town and seeing people eagerly waiting outside for their copy. What the Photo News roving reporters wouldn’t go to probably wasn’t worth knowing about — they went to everything from birthdays, engagements and 21sts, to Boy Scout excursions and mother daughter badminton mornings — nothing was considered irrelevant. They even went to the opening of a fridge when it was gifted to a local children’s home. It started small — a darkroom in his Gisborne home — but at its height, Logan Publishing was printing Photo News editions for nine regions around New Zealand — a total of 60,000 copies a month, or nearly three-quarters of a million every year. Similar magazines for other towns around New Zealand which belonged to his franchise were produced for Whangarei, Tauranga, Rotorua, Taranaki, Wanganui and Nelson. They also printed editions for Waikato, Thames-Paeroa-Matamata and Franklin. Assembling the Photo News was a manual task. Photos were pasted onto a larger piece of paper and the text was created on a typewriter and pasted alongside, before being put onto screens and printed. The flagship edition from Gisborne was printed for 21 years. By that time John Logan says it was no longer viable with more photos being published in newspapers, magazines and with the popularity of television. These days the publication is more important than ever as a representation of a social slice of life and cultural change in provincial New Zealand used for all manner of research. As many people featured in the Photo News are still alive, please respect the spirit of the project when making electronic copies available, and follow the guidelines on copyright and image use.